Announced back in July of this year, the Nokia OZO virtual reality camera was a huge surprise. Not many expected the Finnish phone company to jump into VR, let alone make a $60,000 (about £40,000, AU$83,000) device for professionals in the filmmaking world. But apparently, that's exactly what Nokia's been planning for a while – even before Facebook bought Oculus and launched VR into another realm of possibility. Vice President of Digital Media at Nokia, Paul Melin, told us the company's move into VR was "not an accident", and was in the works well before interest in VR began growing in the last couple of years. 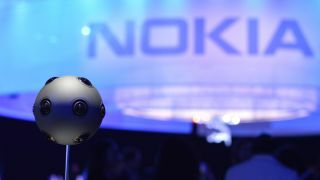 Melin says the OZO is Nokia's way of continuing to "connect the world" – an idea the company is very familiar with considering its brand is synonymous with the early generations of mobile phones. So why VR? As Melin explained to a room full of Hollywood filmmakers: "We don't see this as a niche market...we believe this will be the media of our children." For Nokia, virtual reality is here to stay – and the company wants to be a leader in providing the tech. After hearing Melin piece the puzzle together, Nokia and VR makes more sense than you might have thought. It all began with the Nokia phones and a small, determined team of engineers. "It was definitely not an accident we chose to invest in VR," says Melin. "But it was not the result of some insight, strategy investment. A couple of years ago, a handful of engineers came up with an idea and wanted to test the idea. We didn't originally plan to make a professional product. It was simply to make a VR camera. "During our mobile phone days, we had a very wide array of technologies that we were researching on video coding, audio quality, multimedia experiences, better cameras, user scenarios – everything that you could experience with a mobile phone. So in that way, it was not an accident that this idea came and we wanted to invest in it." The process proved successful, particularly given the growing interest around virtual reality, and Nokia found its new calling. Melin says there are no plans to make head-mounted displays like the Oculus Rift, HTC Vive or PlayStation VR – but never say never. Although Nokia wants to supply a camera to make "richer experiences" for everyone to enjoy, Melin does appear to leave the door open to the possibility of an HMD in the (far, far) future. "Most people have never heard of virtual reality and never experienced it," he says. "From a market point of view, we saw that the greatest need is to have tools that enable seamless production of high quality content. That's why we decided to focus on that [the OZO] as the first step." So an HMD could be a second step? Only time will tell. In the meantime, more OZO iterations are closer to reality for Nokia. Melin says the next year or two will be about early exploration and early market entries, along with "consumer education and education of the content community". He notes that everyone is still relatively new to the VR medium and there will be plenty of trial and error – but always more content. "Emergence of more immersive content will progress gradually and people will expect richer experiences," he explains. "In the long term, the biggest potential in the consumer media is the consumer communications platform that virtual reality can enable." What sets this VR camera apart from Google's, Samsung's or the hundred others that have emerged from the woodwork? Nokia's puffer fish design isn't just for looks.